Tokyo Direct contacted me recently and offered to send me some of their Japanese instant ramen noodles to try and review. When am I ever going to turn down ramen? Instant noodles aren’t something I eat a lot of (although I’ve always been partial to the very occasional chicken and mushroom Pot Noodle- who isn’t? ), but I thought these would be interesting to try. Tokyo Direct is a website which sources Japanese foods, tea, snacks and other lifestyle products direct from Japan. Their range of ramen noodles online is quite extensive! 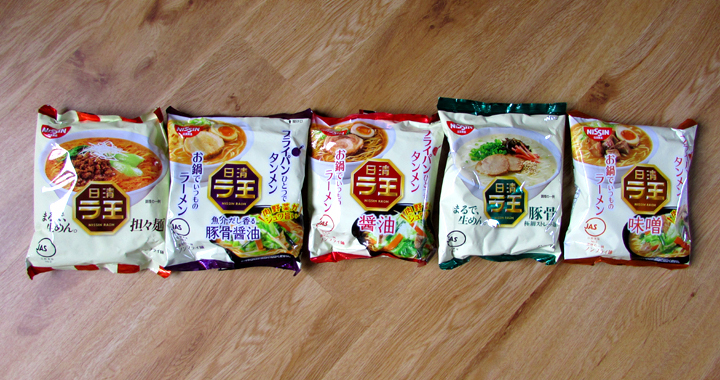 They sent me an assortment of the Raoh brand ramen, in different flavours. The first thing I noticed on getting them was that the packaging is entirely in Japanese. This is quite intimidating for someone who doesn’t understand a word of Japanese, so no way of knowing what is in them. There are, however, allergens listed on the website for the products as are instructions for how to cook- they are simple enough- cook in boiling water for a few minutes, then add the flavour and oil sachets. The people at Tokyo Direct did label them for me, so I knew what the flavours were: tonkotsu, miso, tonkotsu (fish broth), shoyu and dan dan noodles. 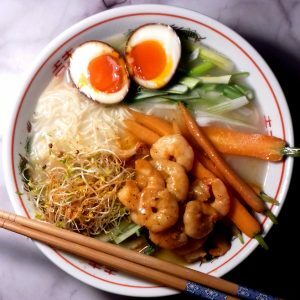 I opted first to try the tonkotsu flavour and used them as a base for a proper ramen meal, with ramen egg, my garlic sriracha prawns and vegetables. This seemed a good way to eat them as they are quite filling and for me, too much for lunch. I was a bit disappointed in the tonkotsu broth flavour, as it was a little bland. I have since tried the shoyu as a quick lunch and miso noodles as traditional ramen, which were both much tastier. 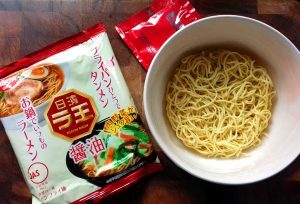 The noodles have a good texture and it is nice to try some more Japanese flavours (the most exciting flavours at our supermarkets are chicken and mushroom or curry flavour!!). This aren’t something I would eat all the time, as they are filling and probably not the healthiest thing to eat, but for a quick ramen dinner, they make a good base. 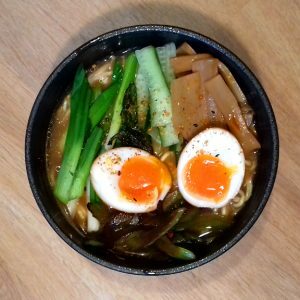 Add some fried shallots and garlic to the broth and a selection of toppings and half a ramen egg, of course, and they make a tasty dinner. Tokyo Direct is a great resource for trying all sorts of Japanese food and items you can’t easily find over here. Posted in Reviews and tagged Noodles, Ramen, Review.